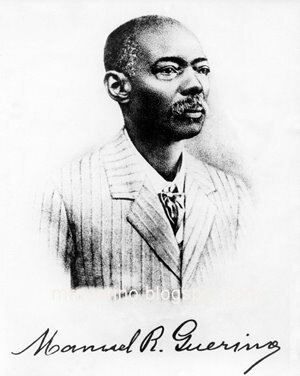 Manuel Raimundo Querino (1851-1923): The spirit of Querino: "It was black people like me who built Brazil"
The spirit of Querino: "It was black people like me who built Brazil"
Brazilian President Luiz Inacio "Lula" da Silva, has arrived in Africa at the start of a week-long visit. Lula acknowledged a "historic debt"
The five-nation tour - which began in the archipelago of Sao Tome and Principe and then Angola - will end in South Africa. Brazil has strong historical ties with the African continent - nearly half of all Brazilians trace their ancestry to black slaves imported during the colonial era. 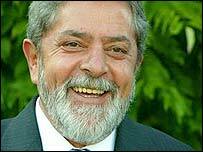 President da Silva, usually known simply as Lula, wants to build a partnership to fight hunger and poverty. Just walking down the street in the centre of Sao Paulo you can't help but notice the incredible African influence on this country. It's everywhere - whether it's the samba music blaring out of the record shops, the food that's on sale in the markets or, above all, the incredible racial diversity of the Brazilian people. The links between Brazil and Africa are all around you. "It was black people like me who built Brazil," a trumpeter in a street band told me. He said the Portuguese came here with millions of slaves so of course the bond with Africa is strong. However, some people angry about the President Lula's Africa trip. "Lula promised lots of things but he's done nothing," he says. "There are people starving and homeless in Brazil - he should be sorting out things here." Speaking before his departure, Lula acknowledged what he called Brazil's historic debt to Africa - a reference to the four million black slaves who were brought here by the Portuguese. The president said he was proud that Brazil had the second largest black population of any country on earth. Nigeria has the largest. "After decades and even centuries of turning our backs to Africa, we feel that we have the conditions now to feel together with the Africans our common identity," says Pedro Motta, a senior Brazilian diplomat in charge of relations with Africa. Mr Motta says that Brazil will honour its historic debt by funding health and education projects and by sharing expertise in the fight against HIV/Aids. But he says there's a second purpose to this visit in terms of Brazil's relations with other developing countries. "There is also the question that is central to our foreign policy and that is that we want to strengthen our co-operation in the south-south direction. "Africa, of course, is part of this, as India is, and it's important to strengthen our basis for negotiation with the industrialised countries," says Mr Motta. Preserving the coalition of developing countries that came together at the Cancun trade talks is perhaps the top priority in Lula's foreign policy, according Silvio Caccia Bava, the director of Polis, an independent think tank in Sao Paulo. "The most important, I suppose, is to have the participation of African countries in this new articulation that involves China, India, South Africa, Brazil, to create a new collective actor in the international scenario to say 'look, the south needs new rules'," Mr Bava says. 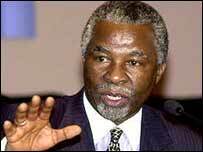 A key ally in that cause is President Thabo Mbeki of South Africa, who was in Brazil last week paying tribute to Lula. "Brazil under your leadership has set itself on a new course which is of importance not only to Brazil but I believe to the rest of us in the rest of the world who are involved, as you are, with attempting to meet the challenges that face the poor of the world," Mr Mbeki said. As Brazilian schoolchildren serenaded Mr Mbeki, Lula was already preparing for the return visit. 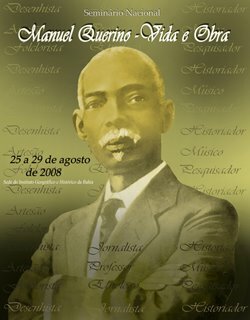 His tour will end in South Africa, sealing a deep bond between Brazil and the continent that helped shape its identity.